Cyndi, I love these Tagua nut beads! I would love to win! I just read the interesting article on the origin of Tagua beads.Beautiful beads in lovely colors!Greetings from Greece! Ohhh what a great giveaway. I am very aware of Ecuadorian Hands and the fabulous product they carry. Please count me in. I would love these beads. I have always looked at and admired Tagua beads. I would love to win these and work them into my jewelry designs. My email is aneri.masi at gmail. I didn't know until today what vegetable ivory was. I would love to make some jewellery with it. I've written a bilingual post about tagua beads and this great giveaway. Thank you. I've shared on my FB. 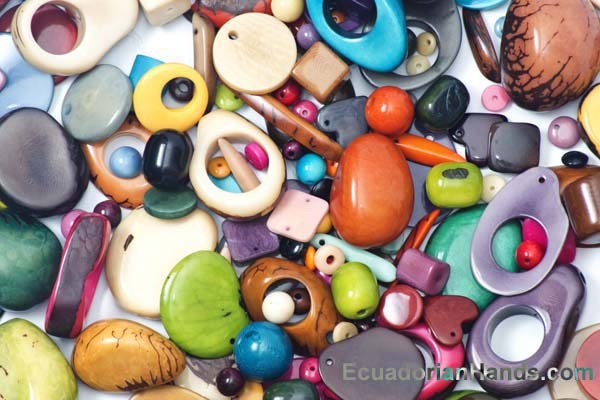 Oh, Tagua nut beads - I've been admiring them for a while; I would love to win them! I've been wondering about how I might use tagua nut beads. Winning these would give me the opportunity to "play" a little. Wow! !So beautiful beads!! I wish, I am lucky!!! Kisses from Greece. Tagua nut beads are perfect for use in light weight jewelry for people with arthritis of the neck. The shapes and colors give a wide range of design choices. I like to use it in fiber jewelry. You can reach me at mouski7@yahoo.com. I have been intrigued with Tagua nut beads and slices since they first hit the jewelry design market a few years ago. Needless to say I would LOVE to win some and see what I can create! Beautiful beads! I love natural beads! Thank you! These beads are so beautiful! What a fabulous giveaway this is! I would soooo love to win some of their beads to try and work with. I have buttons made from the Tagua nut - I'd love some beads! I didn't know that there are seeds looking like ivory!! It's amazing!! Thank you very much for the giveaway!! What an awesome giveaway! Pretty please count me in! Thanks a bunch! Thanx Cyndi for a chance to try Tagua nut beads. They seem really interesting to me. I tweeted about your great giveaway. I can think of a wonderful use for these beads, and I love Tagua nut products. Thanks very much. What lovely beads. These will give a beautiful, organic look to projects. Love, love, love to win some of these beautiful beads!!! Count me in for the giveaway. I would love to play with these. Gorgeous colors, organic material (sometimes described as vegetable ivory!) - love 'em!